The term “humanism” in its current Chinese form made its way into the cosmos of Chinese thought as a rather lonely stowaway in a Japanese translation of Schopenhauer: “The belief that mankind is the root”. Of course today, when Chinese people speak about what we in the West would define as “humanism” they find their own idioms and metaphors, where Schopenhauer’s role is naturally only a subsidiary one. So how did the courageous curators in Canton come up with this term? Two simple thoughts perhaps hold the key. “Humanism” has, as already mentioned, the premise that “mankind is the root”. The decisive thing here is the idea of the root. The word “capitalism”, which radiates a so much bigger promise in today’s China, accordingly means “The belief that capital is the root”. Every Chinese person, if you will excuse the exaggeration for a moment, thinks in signs, in the characters of his culture. “Capitalism” and “humanism” are only a single character apart. Man against capital. A blind storyteller being led over the mountain pass will understand that, as will a mother trying to breast-feed triplets – as will even an onlooker staring through his shades at a victim on the road. Interesting, but a few pendantic points. Second, the contrast suggested between the “human/ism” in the exhibit and “capital/ism” is interesting, but the point can be made perfectly well on general lexical and etymological grounds, without appealing to a problematically Orientalist notion of how “every Chinese person…thinks in signs” (what does this mean? don’t we all think in signs? 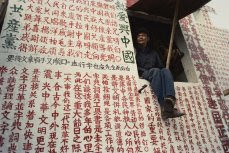 if, instead, the author is implying the facile and controversial notion that Chinese speakers are particularly attuned to the specifically graphic nature of their written language, this would appear to be a rather gratuitous, exoticizing point with no discernible relevance to the argument at hand). Third, on an unrelated matter, the original article states that it is unclear whether photography was invented in the West or in China. China can boast of many inventions (printing, paper, gunpowder, etc. ), but photography is not one of them. While photography was introduced into China shortly after its invention in Europe,here is no evidence that photography was invented in China and, in fact, most of the earliest photographers in China during the mid-nineteenth century were actually Westerners. Thanks for the helpful comments, crojas. Yeah – I perhaps linked to this thing a bit too quickly. The Pound / Fenollosa bit – the Chinese think in pictures – is too much, yes. Mostly I just liked the pictures. Anyway – your site is fantastic… I don’t know why it hasn’t been in my links, but it is now. (p.s. it looks like my site does appear on your side-bar, but at its old blogspot address, rather than its current http://www.nakedgaze.com one). I’ve fixed the link – both the old and the new addresses were there, the latter was just invisible. I forgot to “name” it… Typepad….